“One Night in Rio” opens the door and offers fans a view behind the scenes. 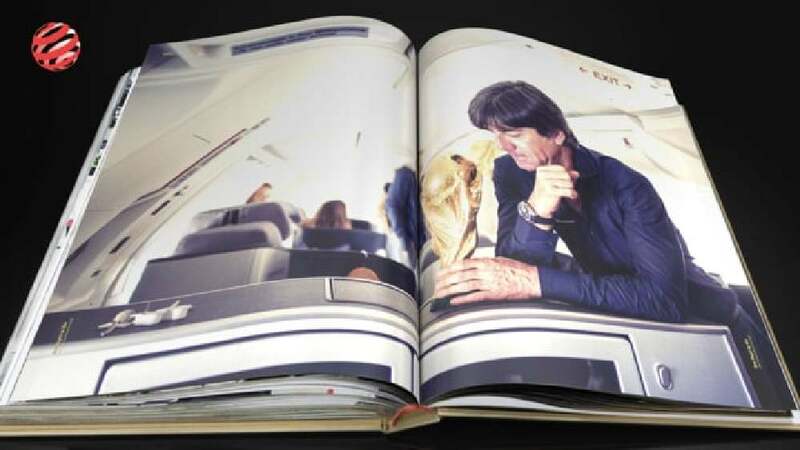 The 408 pages of the book impressively document the decisive hours of the 2014 FIFA World Cup from the perspective of the German national football team. The camera accompanied the team on July 13, 2014, during the night of the final in Rio, as well as on the return journey to Germany and the welcome celebration on the “Fan Mile” in Berlin. The basis for the book’s design is the corporate design of the German national football team. The team’s colour scheme is also used for the book cover and refined with a lot of gold worthy of a world champion. The typeface and layout are consciously kept low-key in order to give the pictures the corresponding effect. Many graphic details reflect the chronology of events: the logo of the national team is thus shown first with three stars – only after the 90 minutes of Rio is the fourth star added representing the fourth title win and the colour of the page numbers changes to gold. In addition to the fan edition, the book also comes in a premium edition with gilt edging on the ornate slipcase. This truly eye-catching book fascinates at first glance through its oversize format and the high-quality print with embossed title, as well as the linen cover and slipcase. Together with the subtle, unobtrusive typography, the design stages the wonderful portraits and photographs documenting the exciting time around the title win in full-size images to highly impressive effect. Oliver Bierhoff, Deutscher Fußball-Bund e.V. Thomas Beheshti, Deutscher Fußball-Bund e.V.